Found in the Trans Pecos and Panhandle ecoregions, mule deer is an iconic Texas species. Biologist, Shawn Gray, says populations cycle up and down over the years. A long, long, long time ago, we used to have a lot of mule deer up in the panhandle before European settlement. But, through different range practices, and different land use practices and unregulated hunting, we depleted the mule deer population up there. But through years of better management and restoration efforts, it seems like the population up there is doing pretty well now. Gray is the state’s mule deer program leader. Texas has an estimated population of 285,000 mule deer…that’s despite a decline in the Trans Pecos population at the Black Gap WMA during the last drought. In 2011, we reached almost an all-time low in our mule deer herd from the 70s. So, when you look at that 2011 number to today, we’re looking a lot better, for sure. Through focused population management, including translocation of animals to these areas, as well as habitat improvements, the state’s mule deer population is stable to increasing. There’s not very many places that really need a lot more mule deer. And hopefully we’re beyond that [translocation] with our last translocation to the Black Gap, if everything’s working in our favor. 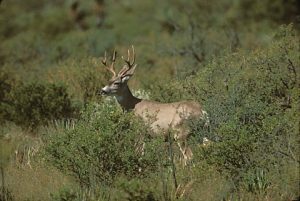 The Wildlife Restoration program supports our series and funds Mule Deer restoration in Texas. For Texas Parks and Wildlife, I’m Cecilia Nasti. This entry was posted on Tuesday, August 14th, 2018 at 12:00 am	and is filed under Conservation, mule deer, Wildlife, Wildlife and Sport Fish Restoration Program. You can follow any responses to this entry through the RSS 2.0 feed. You can skip to the end and leave a response. Pinging is currently not allowed.